Tagged under School Uniforms, Swimsuits. 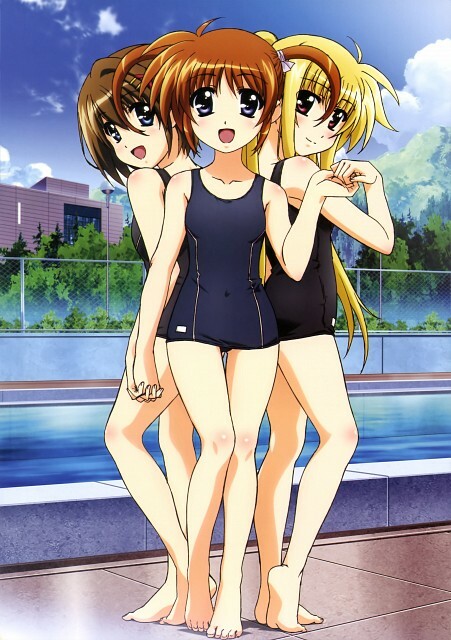 Japanese school swimsuits are plain one-piece suits; the newest style is known as the "straight form" (ストレート型) and usually has white lining along the straps. The old style of sukumizu featured piping up the sides and an extended skirt to create a bloomer-like bottom. School swimsuits are almost always the traditional navy blue, but they can also be white. A rectangular white patch is sometimes sewn on the chest of the suit for the student's name to be printed on. Tip: for convenience, use the alias "SS" when adding this tag to images.